For every holiday gathering – whether Thanksgiving or Christmas – the non-negotiable dishes my family requests of the Taylor Household is that we bring RancherMan’s Famous Green-Bean Casserole and my sweet, desserty no-cook Cherry Schtuff. Now in the past I’d simply buy a can of cherry pie filling. But I was often very disappointed at the abundance of filling and significant lack of actual cherry in those cans. So these days I’ve found it’s much cheaper and oh-so-much-more delicious to make my own cherry pie filling. I use either canned or frozen cherries and BOOM! 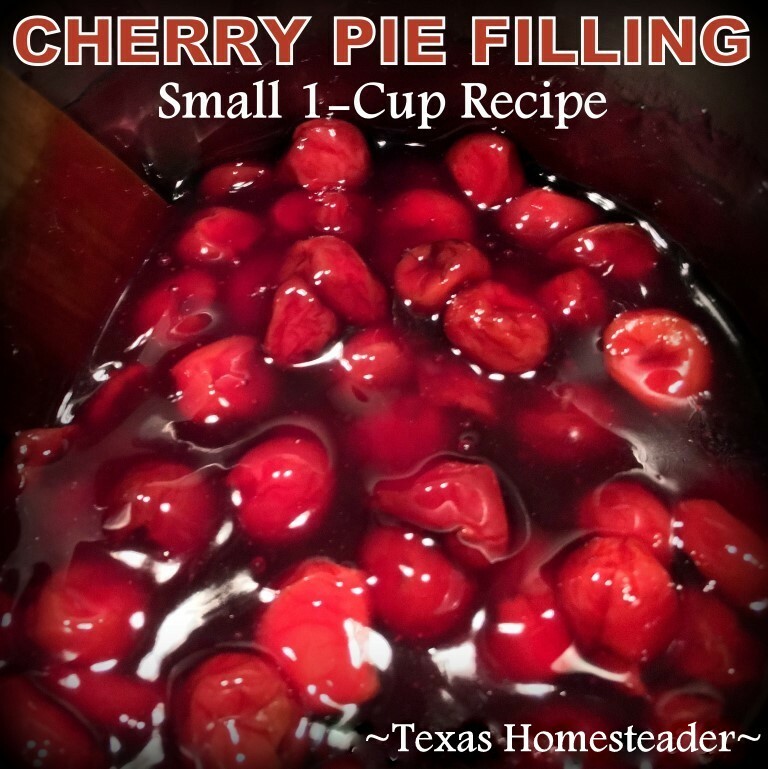 I use the quick & easy recipe below to make a small 1-cup recipe of cherry pie filling. I’ll often double it when I’m making my Cherry Schtuff dessert so it will be even more cherrylicious. Why not? It’s EASY! WHISK together 1/2 cup cherry liquid, 1/3 cup sugar, 1 HEAPING Tablespoon cornstarch in a saucepan. Bring to a boil over medium-high heat, stirring constantly. Boil until thickened and mixture begins to bubble. Add 1 teaspoon lemon juice. Return to a boil and boil for 1 minute, stirring constantly. Add reserved cherries all at once. Return to a boil, stirring constantly but gently. Remove from heat, stir in 1 teaspoon vanilla. 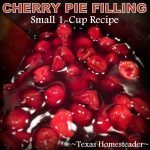 This entry was posted in Blog Posts and tagged Cooking, Frugality, Holidays, Make-It-Yourself, Recipes on November 12, 2017 by Texas Homesteader. Tammy, when you can this filling do you use pints (2c.) and water bath them for how long? So tired of the high prices for less cherries. Thank you so much. Did I miss the recipe for the cherry shruff? This looks so simple. I am going give this a try. How many cups do you need for a pie filling?